Last month, I never made it to the bank to fill up my envelopes. We wrote our zero-balance budget as usual. I paid bills online. I exported our account data into Quicken weekly. The only thing missing was cash. At the grocery, I swiped my debit card. I never counted extra bills to cover that extra bag. At the thrift store, I splurged on white hotel towels, vaguely wondering how much remained in that category online. I stuffed receipts into the back of my wallet, never to see the light of day. Simple! Clutter-free! Quick! A girl could get used to this. By the 4th week, I had eaten through all my virtual margin. I calculated 20% higher spending during a month when I usually tighten the belt. All without feeling so much as a pinch. Tomorrow, I'll share the tool that's helping me get back on track. In the meantime, I'd love to hear your methods of keeping spending in check. How do you make those purchases register before you see that month-end statement? I rarely carry cash, and when I do, it's usually a large bill that I'm hesitant to break. I use plastic for everything, even the random drive-thru at McDonald's with the kids. But I stick to one card only, and I check its balance daily. This keeps me accountable, (as I know how much discretionary income is available) as well as honest (no slipping in cash purchases beneath my husband's radar). We've done it this way since marrying 8 years ago, and it works. It's funny, because plastic vs cash seems to be a personal choice. While I understand the reasoning behind using cash only, I actually tend to spend my cash a lot faster and without thinking. And after, I have no record of where it went! I guess I'm just simple when it comes to spending. When I swipe a debit card, it doesn't feel like I'm spending money at all. I guess I prefer that frisson of fear when it comes to making a purchase...do I have enough money with me? We use our debit cards for 99% of our purchases. Through trial & error we've found that we have to save every receipt & stick it in the checkbook which is left at home. The checkbook gets tallied every few days & the receipt totals get checked off on the receipt so we know we've accounted for them. (in case I need to save the receipt for return purposes etc..)Both the Hubby & I can see where we're at with our finances so we don't overspend. I haven't used cash for in-store purchases in years, and write maybe half a dozen checks a month for other bills. I use my debit card exclusively, and diligently keep up the checkbook register on paper. A couple of times a week I'll check with my bank on-line and reconcile their balance to mine (not difficult when you write only a few checks a month). And yes, periodically I put everything in Quicken, but I do it manually as the transactions occur, not waiting for the statements or a download. Why wait when I can see my bank activity on line? Honestly, it took longer to type this than it does to actually do the whole process. when i use debit, we go over every single time.....oh its easy they say, when the moeny is gone its gone..but that other money was for other things....waiting for football registration day...paying something ahead istead of later. btw, after every day i go online and update my excel sheet with all the transaction and growl...with cash, its all done when i tell dh, to go to the bank in his building and take out...x20s x 10s and so on..
We actually put all of our purchases on our credit cards, but we use a spreadsheet tracking system that tallies all of our "envelopes". I update this a couple of times a week so I always know how much is available in each envelope. We didn't start with this system, though. We actually began using the cash in envelopes system, and once we started to understand what that "felt" like, we were able to move to using credit cards without overspending. I use only cash and checks,my check book is always balanced and I'm never overdrawn.One thing I have found recently is that many cashiers don't have the proper amount to give me change, so I have a feeling I'm in the minority. Also, when its spent its spent! My husband and I have gone 'round and 'round between whether cash or debit is worse for spending. For me, I was drilled over and over that it's not free money, and that you'll overdraft if you don't watch it. Cash, though- yeehaw! If you have cash, it's okay to spend it. So yeah, I'll spend $3 on snacks at the mall if it's cash, but I wouldn't consider doing the same with the debit card. Well, I wish I could say I am good at it...but I am not! I do check my bank online often...I spend cash as fast as credit...I have weak moments! I don't carry cash. We use our credit card for EVERYTHING. We get great cash back rewards (about $750/year), so we have no plans of changing our system. We keep our spending on track with the budget by checking our account almost daily. Besides, after years of living on a bare boned budget, we are very aware of how much we can spend. It works for us. I was taught using the envelope system as well. However, I use my credit card as if it were a check/cash. I record those transactions separated into categories into a register in Quicken (manually) and balance that register with the statement each month. My "envelope" report pulls all payments from all categories in both the checkbook and credit card. Then when the credit statement comes, it is just a transfer from checking to credit in Quicken to record the payment (which is auto drafted in full from my checking account on the credit due date). It probably wouldn't work for everyone, but it works for me. I use a plain old cash only envelope system and love it. The debit card is too easy for me to spend without thinking. We use Crown Financial Money Map software as a virtual envelope system. We keep all receipts and I account for them once or twice per week. So we see 'envelope' balances weekly. Wow, I've always heard this in theory, but never sat down to actually calculate the difference in our house. We struggle with our envelope system, but it works, so we're trying to stick with it. so what do you do in a marriage where one of you wants to use cash (me) and one of you wants to use a card (dh)? i'm with you, meredith--i spend much less when i have cash, always afraid of whether i have enough money or not! I use a debit card and check and record purchases daily with online checking. For purchases like groceries and gas we have a budget. So I just add everything up(I keep a blank notebook for this and monthly bills) and when we reach our limit which happened for groceries this month already-I stop spending except for milk and eggs. We have a cash envelope set up for our groceries (along with some other expenses as well). The weeks I use the debit card for groceries instead of cash, I always go over. Not by much, but even little bits add up over time. I admit, we use plastic for everything. But only because we budget through www.mint.com. That has REALLY helped me! I am a visual person, and logging on here every day helps me keep my spending under wraps because I am in a contest with myself. I love it! Can't wait to see what you come up with. We suffered the same plastic syndrome this past month or two and it feels awful! I'm not as consistent about it as I 'd like to be but cash seems to be the only way I actually stick to the budget. I haven't been using envelopes though. I just take out one lump sum and that covers it all until the next pay day. I think the system that leaves you living within your means is the one that works. For me, all I have to do is look at our budget spreadsheet (and history) to keep most of my spending in check. Oh, and I don't go to Target, I send my husband -- otherwise I never walk out spending less than $100. Target is my downfall.... Knowing where your weaknesses lie is essential. I think it's true that most people spend more money with plastic than with cash. Yes, you might not use your card for tiny purchases like a pack of gum, etc., but you do spend more on larger purchases. The card issuers know this, too, and try to get you to use plastic because they get more merchants' fees that way. Why do you think the card issuers offer cash-back cards? They know most people spend 20-30% more with plastic, so they're happy to give you a percent or two of your purchases back. I find that I do tend to spend more when I use a credit card versus cash. I use both because I'm not very good about going to the bank to get cash out. Having said that, we have a pretty big cushion in our budget so if more gets taken out from a category in a month, it is usually not a big deal. Our savings - 401K, IRA money, and children's retirement come out first so we're in good shape. My husband and I have developed our own system for budgeting. It has taken us seven years to get it the way we like it. But now we have a form that shows the expected income for the month and the budgeted amount for each bill. Then we leave a space to right the actual amount of each bill (electric, water, and gas and other bills that change). Then we have three columns. One for gas, one for food and one for "extra" purchases. After each purchase we record the amount of it in the correct column and subtract. Then we always know how much we have left. I have been trying to change our eating habits to be simpler and more healthy. This month I have been able to feed our family of six for $200! This includes paper products and such as well. I try to always carry cash with me. If for any chance I have to use my card, as soon as I go home, I check my balance. Our transactions go through pretty quickly, so we have the ability to see how much is left. I have a great spreadsheet that I use to pay the bills and since part of our rent and at least one bill is paid with each weekly pay check, it isn't hard to know how much is left in the account. Because we get points on our debit card for using it, I do let Hubby use it to fill up the car twice a week. But again, I can see pretty much immediately, how much was used at the pump. I also input my receipts as soon as I get home, after I check our bank balance. I spend more with cash because it is there and easy to get to. I hate having to record every transaction if I use a debit card. And, like someone else said, I will spend $3 or $5 or whatever on something small with cash and would not if I had to bother with a debit card. Therefore it would make sense from an economical standpoint if I did not carry cash, but I would rather spend a bit more than be bothered with keeping up with the transactions. I probably should try the envelope method and see how I do with that. I did go to the Dave Ramsey link in your older post. Do you have a "fun" envelope? It seems to me we might all need one of those - especially if money is very tight - to keep up our spirits. Just found your blog. I use my envelopes and by the end of the second week I know what is left. I have always been really bad at balancing a checkbook. Our method involves pulling out a set amount of cash each pay period for our joint entertainment, his personal allowance, my personal allowance, gifts, and clothing. I use the credit card to pay some of our bills, then immediately pay the card from our bank account. I do this for the reward points we get for using the CC. Free gift cards. For groceries, prescriptions, doctor's appointments, and other everyday things of that sort, I use the debit card. 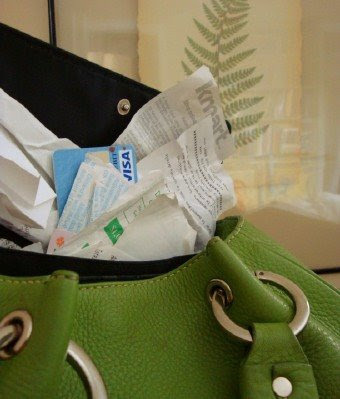 I'm the only one who carries a debit card, as my husband always lost receipts and we twice had his debit number stolen, which meant money drained from our account. So, he only carries cash and a credit card. We use our CC for gas. It's easiest, and it's always paid off. This is a timely post. My husband and I just in the last 3 months have switched over to cash only and I've been amazed at the difference. We used the virtual system before of putting everything on plastic and then immediately taking it out of the budget category and we did well staying in our budget that way, but my husband always wanted to give the cash thing a try. What has been a surprise to me is that we've not only stayed in budget using cash but actually had money left over in many categories (including the food category which I was sure we couldn't cut back in anymore). I guess I tend to err on the side of caution when getting up to the register and not wanting to put stuff back because we don't have the cash, so I tend to leave out the "extra" items. Interesting what works for different people. We have used the envelope system for almost 32 years. We write checks for bills and use credit card for mail order purchases, plane tickets, etc. It's cash for nearly everything else. We have no debt other than our house payment and have put three children through college and married off two of them. I highly advocate the envelope system! So, back to the envelopes and the bank employees that hate me!! I buy everything with plastic, and I keep track of my spending this way: I have two envelopes glued together back-to-back. Each envelope is labeled, one for the money left in the budget and the other for the money already spent. I use monopoly money :) to represent my budget. Whenever I purchase anything, as soon as I get home, I immediately switch the money to the "spent" envelope. I always round up or down to the nearest dollar to eliminate the need for change. For me, handling the paper money gives me a concrete representation of how much I'm working with. We also use a cashback rewards card, and we've "made" quite a bit of money by utilizing this feature to the utmost. I can tell from the color that your bag is amazing! I love green purses! I'm itching to try the envelope method but my husband recently got laid off so we never have enough money at one time to fill the envelopes. I'm doing my best with online budget calculators but it's tough. We rarely carry cash, but I check the bank account online every day to check our expenditures. Once a week, hubby and I have lunch and categorize the expenditures into hubby's spreadsheet. It works like a charm for us. We have used envelopes for the last 20 years. Cash. When the occasion comes along and we use the credit cards---we always go over. I was on the road for three years (making triple my salary) and we never saved a thing because I used a credit card. The envelopes are bi weekly- carefully placed. when we were tight the envelopes were weekly (Amanda). I could see going to a daily envelope if things got really out of hand. Cash envelopes became cash vacations then cash cars and then cash house. We are freed because we have cash and know how much we can spend. It works. I never have more than $1 or 2 in cash on me! I always use my debit card or my Amex and I check those balances every day and I keep every receipt. It takes me just a few minutes each day to enter my receipts. Even the Amex charges I enter into Quicken with a pending category. I also pay my Amex on line every other week. So when I get my bill it's practically already paid (plus I get the Reward points). From what I'm reading, it seems like you have to have a solid recording system in place, whether you use cash or credit. I am learning a lot from both sides of the debate. Thank you for sharing your strategies! We put most purchases on our card to obtain airline miles. But neither of us is a spender, so it helps. I also track using Pear Budget. Being able to instantly see when I've gone over a category in the month is helpful. I wonder if you would adjust to it if you used the cards regularly. Maybe just doing things cashless is what threw you off? Cash is the only way for me to stay on track with our weekly expenses for groceries, cup of coffee, or the occasional meal out. Even though I "think" I'm keeping track in my head if I use my debit card, I'm not. My debit card is only used for gasoline (I fill up every other week), for a monthly prescription, and for doctor visit co-pays. Otherwise I use cash, or use my online billpay at home. My other trick to stay on track with my budget is to STAY HOME. Yep, the less trips to the grocery store or other retailers, the less I spend. Plain and simple. I totally know what you mean. Whenever I don't make it to the bank for the cash I regret it the whole pay period. About once a year I end up doing it though and I always over spend. Cash is concrete and you spend less. Just found your blog on the followers club on MBC. Such a great blog. I can learn alot from you! I'm too afraid of losing my purse to carry cash. We use the card for everything, pay all our bills through online banking, groceries. My solution to over spending to transfer everything we are saving or that is designated over to a separate account right after the money comes in, and to pay all the bills the day we get paid. What's left is what we spend, and I do all of that. :) Except for gas. the GH always asks me if we can afford something before shopping. It's not fool proof, sometimes we over spend, but we're getting better at it as time goes by. The statistics are with you. People who use cash spend 12-18% less because there is an emotion tied to using cash. With plastic, there's no pain. I use cash to keep my budget in check. I purchased a long wallet with three compartments for carrying bills, and I use cash for everything. I have a record of everything I spend, because every store gives me a receipt. I guess it's a matter of choice and organization. I am enjoying all the comments! I use both a debit card and cash system. My income is a monthly one, and I take grocery money in cash at the beginning of the month. I also have envelopes for other things (clothing, etc) that stay at home unless I am going shopping for those things. I get $20 or so each week from the ATM for small daily expenses. Otherwise, I use my debit card and record my receipts daily and balance online every day or two. I pay bills as they arrive and always know how much money I have left for the month. If I use a credit card, I tend to spend too much, but a debit card is like cash to me. Cash for ALL food items. Everything else goes on plastic and 100% paid off at END OF MO. As much as possible on plastic - THAT IS HOW I CAME TO NASHVILLE! Free miles! That is how we took our kids to NYC. NEVER carry a balance though. Loved reading thru this. We use cash only. I get a receipt for everything ~ even if it's only a dollar or two and record it all on my spreadsheet, set up to track spending. We spend more money when we use plastic. The only time using a credit card works for us is if we've planned the expenditure and it's too large to carry the cash for ~ then we pay the card off the minute we get home. We've added something new to our spending that helps with budgeting. But it also helps our church's school and it doesn't cost us anything exta. It's called SCRIPS (I have no idea what it stands for) and the merchants give a percentage to the school of each "gift card" that you buy. The website is www.shopwithscrip.com and it has grocery stores from all of the country on it. We also use it for special evenings out to dinner and other places I would normally use cash. Check it out if you like to see if your school or church is using it. Saving money and helping the community all at once. I use a debit card 99% of the time. I use a simple excel spreadsheet for my budget and I also keep an running total of my bank account, every two weeks, on that spreadsheet. I do it every two weeks because that's how often I get paid. I haven't been overdrawn for some time now and that is a real accomplishment for me. Not carrying cash has it's disadvantages though. Sometimes the credit card machine is not working and the place doesn't take checks...it's happened to me just recently. I, too, tend to spend more when I use my debit card vs. cash. I try the debit card every now and then but am usually back to the envelope system the very next week. 1.Once a week (Sunday for us, on the way home from church) we stop by the ATM and withdraw a set amount. That is, 1/52nd of our annual budget for our cash purchases. 4.We always get a receipt when we spend. 5.At home, we always record what was spent in our budget book. 6.We don't divide our cash up into envelopes or categories because we don't see the need. When it's gone for the week, it's gone. We have to wait until Sunday to withdraw again. 7.We always aim to have at least a little something left over on Saturday night. 8.It just takes a quick glance in the wallet to know exactly where we stand for the week. The great thing about once-a-week withdrawls is it's not too long to wait if the money runs out. And, it's not as scary to carry around because the $ amount is less than a whole month's worth of cash. There's that cool purse!!! :-) We watch our bottom line. Hub tells me to stop spending, and I do. LOL. Real scientific! I'm with you. Cash is the only way for us. We started with a cash system, eventually went to using only the credit card ("for the miles" of course) while paying the balance off in full each month, and now we're back to cash. We were just over spending ALL the time. And it startled me to realize that I rarely even heard the cashier tell me the total due ....just swiped the card, grabbed the receipt, and entered it into our spreadsheet when I got home. It felt like fake money. And I spent it like it was fake money. Now we do ALL cash. Please, Lord, never let my wallet get stolen! This is the first time that I have read your blog and I have enjoyed my read! !..I will say, WE ONLY CARRY CASH!. We do NOT have a debit or ATM card, we do NOT have checks, we do NOT have any plastic whatsoever. If we need something, I have to plan a trip to the bank and withdraw the money. It may seem like a hassel to most but this little tool has helped us cut WAY back on our spending. We actually have time to think about our purchases beforehand. If I dont have the cash on me, I cant make impulse buys. I love it!!! I was excited to see your post, since I am just planning to discuss this topic on my blog this week. I use an envelope system--it is the only way I can control my spending. I have two checking accounts--1 for monthly bills that are consistent each month, and another for my household spending. I leave enough money in this account for gas so I can use my debit card, and the rest I take out and sort into envelopes. It's the only way I have found to stop spending when the money is gone! I never ever have cash. I just can't be disciplined enough with it.. I don't keep track of where it goes.. and $40 later... I'm sitting there like where the heck did that go!? So, with that being said, I use my debit card and a simple program called Personal Checkbook Advantage (free from download.com). Because I have a TON of credit cards and monthly payments, I check my online banking account almost daily and add entries into PCA as needed. It is such an awesome program... allows you to add in future payments and check a box when they go through the bank.. lets you categorize, etc. Check it out, it's bee a lifesaver for me and makes me stick strictly to my budget! I hate going through the trouble of getting out cash and putting them in envelopes, however, I'm going to have to start doing that. I also need that fear that I won't have enough money. As of right now if I overspend in the grocery store, I just take that from some other fund that was there for another reason! This payday I'm going to the ATM and not looking back! I'm visiting from Stretching a Buck's blog....I'm working on trying to become a little more finacially "responsible" myself. I'm a big debit spender but I get myself into trouble with my card so I guess it's time to try something new. I think in this time of economic uncertainty you really start seeing people pay for things in a different manner. For example: My uncle raises beef cattle and sent a bunch of steers to slaughter (he had a list of people that put there name on one of the animals) and when it came time to pay my uncle back for their portion their steer one gentleman paid cash for his portion (a really large sum of cash). I find that I'm somewhere in the middle. The Man Beast and I have a cash allowance. That's about the only cash I have on hand. My bills are either paid online, with a check or with a debit card. I use an excel worksheet I borrowed from Grandpa Terry over at Budget Stretcher and use that to track my expenses. It works very well for us.